How did you spend your New Year's Eve? Did you go to a party? Out to eat dinner with dancing afterwards? Maybe you stayed home and celebrated quietly. You'll never guess how we spent our New Year's Eve! Let me give you a hint..... it started with a First Aid Kit. Now, before you get all worried and concerned that maybe one of us wound up in the hospital, I'll confess the truth. We spent our New Year's Eve at the local Longs Drugstore spending the leftovers in our Medical Savings Account. (MSA) Each year, we sign up for an amount that gets withdrawn from our monthly pretax dollars. This past year we over estimated just a bit, and in this industry, you use it or lose it. December 31 is the last day, or in our case, evening, you can use it for the year. What you haven't used goes into that land of limbo funds you will never see again. Wes had his eyes checked in early December and ordered prescription sunglasses, regular ones and safety glasses for work, about $600 worth. Even with that, we still had money to spend. So yesterday, armed with the list of acceptable items, we went shopping, with only one hour before the store closed for the night. Then, we will have until April 1, 2009 to submit our claim and have it paid out. All in all, it was kind of fun. 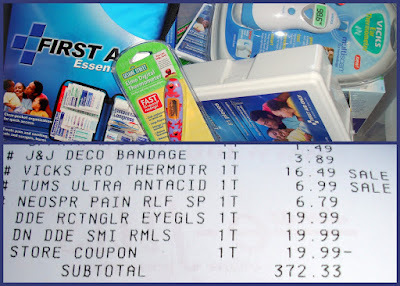 We bought pain relievers, thermometers, First Aid supplies, antacids, suntan lotion and lots more. We spent an hour in the pharmacy area making sure everything qualified for the deduction. Even with this purchase, we will still "give away" about $300. Needless to say, we already reduced the amount the two of us will use next year. We heard the revelers at midnight sounding the advent of the New Year. Lots of firecrackers, M80's, "Screamers", pots and pans and general screaming and mayhem. It must have gone on for a half hour! We got back at them though by having our DISH guy come out at 8 in the morning to make all kinds of racket rewiring our TV setup (yes, they work on New Year's Day!). When he showed up, my dogs must have barked for the first half hour, all 4 of them, LOUDLY! As far as New Year's Day goes, Mike will be coming over later to do a little work on the bathroom fix-up, Wes III will be driving from Tracy to here in the moving truck with his in-laws and we will probably do a little Tri-Tip BBQ later on in the day. Tiffany brought her dog, Nixie, over this morning for a play session with Wilhelm, Wes III's weiner dog. They love to get together and play really hard. Now he's sleeping like a log on the couch.